The 12-person group accommodation at Vakantiepark Giethoorn is not your average holiday home. The Kraaiennest (crow's-nest), as this type is known, is constructed on poles, so can only be reached by a stairway. The advantage is that you have lots of privacy. However, it is less suitable for people with mobility issues. The accommodation has a very comfortable interior design. The pleasant eat-in kitchen is ideal for lingering over a leisurely meal with family and friends. 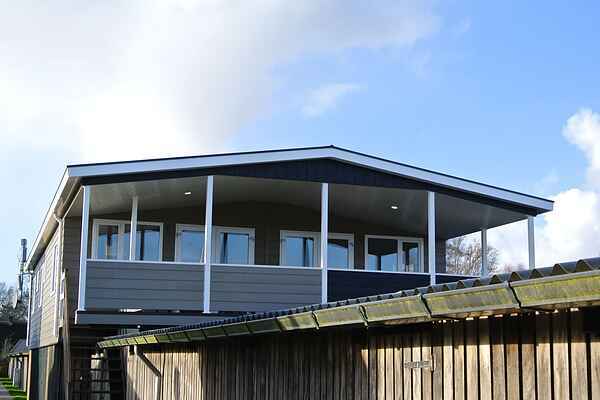 You have a great view of Het Bovenwijde lake from the living room and of course from the covered terrace as well. From Easter till half October the villa also includes a luxury boat for up to 12 people.